I love making a list. I don't know why, but there is something so satisfying about crossing something off, even if it is something tiny like making a phone call or sending someone an email. My most productive days often start with a list. I think that having goals in life are important - goals to improve your life, goals to make you happy. Sometimes you may want something that seems so incredibly out of reach that you don't even try in the first place. That's where I think a list comes in handy in goal setting. Nobody ever climbed a mountain by starting at the peak. A list is a good way to map the path to your ultimate desired end result, and an excellent way to be able to look back, midway through your journey and say "look how far I have come already". If you don't give yourself credit for the journey, how are you supposed to enjoy the destination? Overall, I think what they accomplished was pretty awesome, and it thrilled me beyond belief to see them getting out and doing it - after checking off many of the goals on their list to get there. Figure out what you want - what you really want... whether it is to ride at all, or to ride a dressage test with your horse. Figure out the steps that will get you there and write them down, and then work toward each component on your list. It is easy, when you are far away from your goal, to get mired up in how long it is going to take you to get there or how many hurdles you have to go over to make it to the desired end result. I find that breaking things down into smaller, managable targets to achieve helps you not to get frustrated or discouraged, and allows you to feel success and bolster your self confidence sooner, which I think helps you to continue to achieve your goals. Once you have accomplished something and feel good about yourself for doing it, the next task becomes that much easier. So let's discuss - what are your goals and share your list to get there! Troxel's 4th of July Sale! 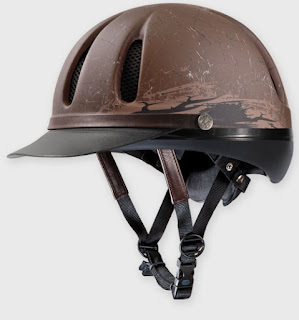 As you all know, I am a big advocate for helmets - and I think this is pretty timely - we are coming into the season where a lot of riding is done and Troxel is having a fantastic sale. Some of their helmets are as low as $25 and they are having FREE SHIPPING. This is the "Dakota" which comes in a variety of colours and normally ranges $79.94 - $84.94 but is currently on sale for $59 in black! There's really no excuse not to, now!